How fast the year has flown by. We had a great Christmas this year with lots and lots of food. In fact, R and I are resting our stomachs now. 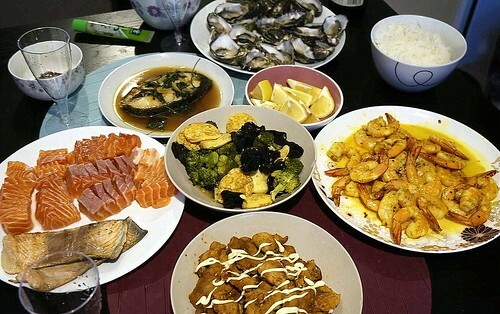 Our simple Christmas Eve dinner of oysters, salmon sashimi (this is our weekend staple), crispy salmon skin, mixed vegetables, pan fried cod fish, peking spareribs with mayo and creamy butter prawns. Washed down with glasses of cider :). We were invited to our first Aussie Christmas lunch by T and family. 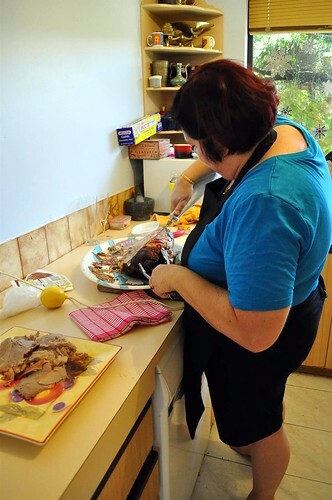 It was a lovely experience with all the traditional dishes such as this roast pork which was being carved up by T. T got up at 5 in the morning to start preparing the Christmas feast! 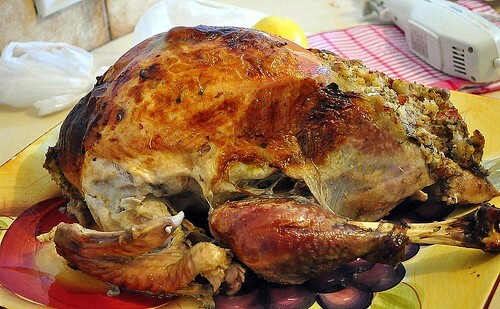 Gigantic moist and tender turkey which T had brined overnight. 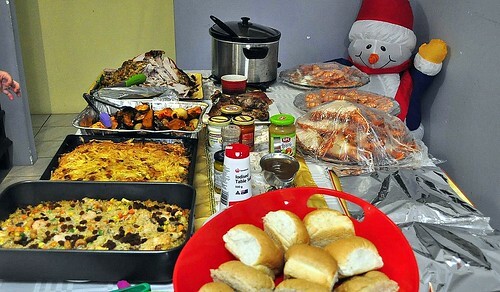 The massive Christmas feast which included crayfish, cold prawns, potato bake, turkey, roast pork, roasted vegetables and garden salad. My offerings were fried rice and Malaysian chicken curry, bringing a bit of Asian flavour into the traditional Aussie Christmas lunch. 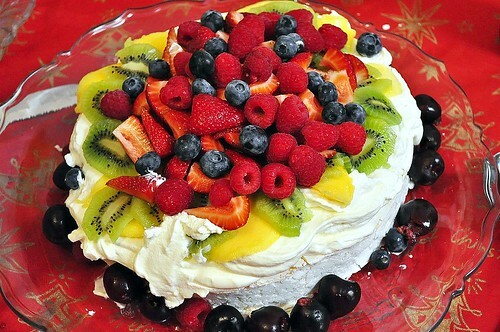 The pavlova or ‘pav’ as Aussies call it is an ultimate must for every Aussie Christmas do. Very pretty piled high with a wide variety of fruits. 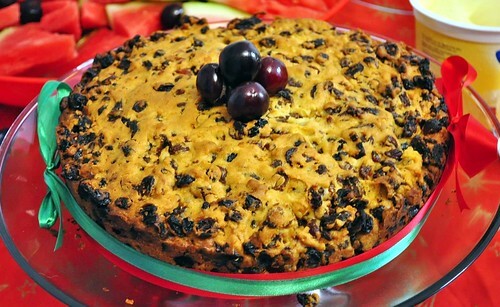 T’s daughter made the Christmas rum cake which was nicely spiced and heavy on the rum, yums with custard. 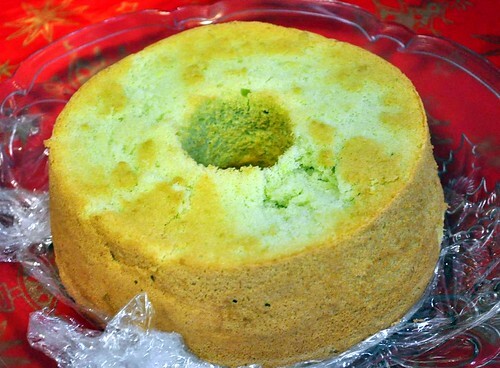 Hehe, T asked whether I could make a pandan chiffon cake for dessert, her relatives were very curious about this cake and said it was light and fluffy, only they had it with cream and custard, haha. T’s house looked like Christmas exploded with teddies, snowmen lined up in every corner of the house. 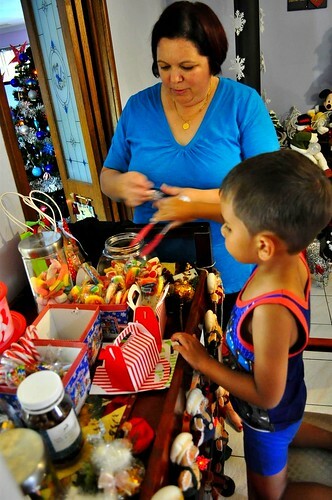 I admired her candy corner which was popular with the kids and adults! T’s family were really nice and friendly and we had a lovely time. We were so stuffed after the massive Christmas lunch and had a late simple dinner at home. 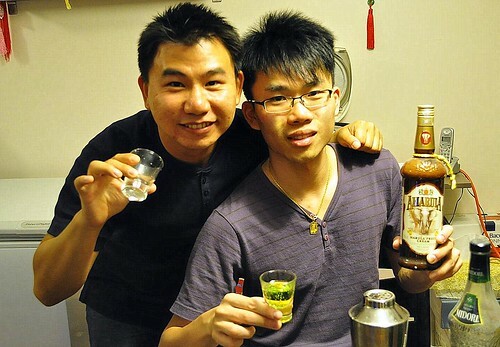 Gerry came over and R started bringing out his dusty bottles of liquor which have been hiding on our shelves for years. This was the before shot. 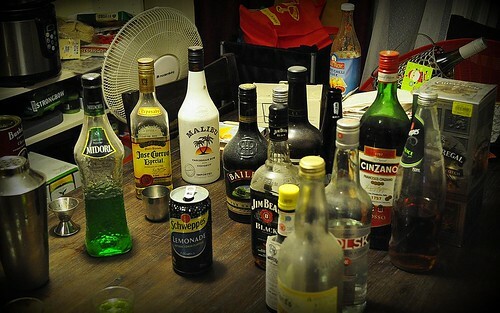 The after shot … was pretty similar, hehe they didn’t get smashed and were safe drinkers. Boxing Day was all about shopping or more like window shopping since we didn’t end up buying anything. 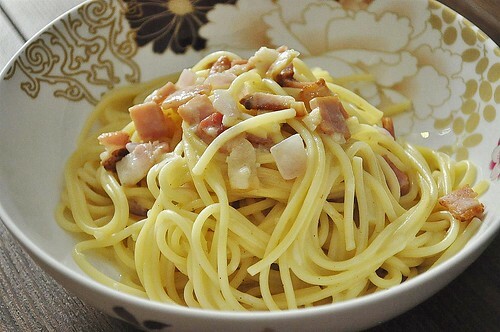 Dinner of spaghetti carbonara and trying to get used to the idea of working tomorrow. I hope everyone had a wonderful Christmas too.